PolyJet 3D printing is similar to inkjet document printing, but instead of jetting drops of ink onto paper, PolyJet 3D Printers jet layers of liquid photopolymer onto a build tray and instantly cure them with UV light. The fine layers build up to create a precise 3D model or prototype. Models are ready to handle and use right out of the 3D printer, with no post-curing needed. 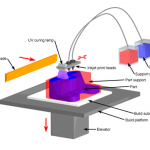 Along with the selected model materials, the 3D printer also jets a gel-like support material specially designed to uphold overhangs and complicated geometries. It is easily removed by hand or water. PolyJet 3D printing technology offers many advantages for rapid prototyping, including astonishingly fine detail, smooth surfaces, speed and precision. The technology works with a vast array of materials, including rigid opaque in hundreds of vibrant colors, clear and tinted translucent shades, rubber-like flexible materials, and specialized photopolymers for 3D printing in the dental, medical and consumer products industries.